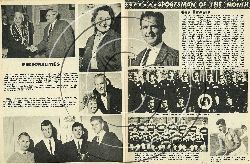 In the post-war years, few Rugby players in either the Nelson or Golden Bay-Motueka unions have attained real eminence. Among the very few, and undoubtedly the best known, was Richard Guy Bowers. Although Guy played most of his big football outside this district, it was within the two unions that the basic skills that were to take him into Bob Stuart's 1953-54 All Black side were learned. He attended Nelson College from 1946-51, playing his way up through the grades, mostly at halfback, until in 1941 he was selected for the First XV. His first few games for the College side were at second five-eighths but he found his true position in the side at first five-eighths and from that time on seldom played in any other position. 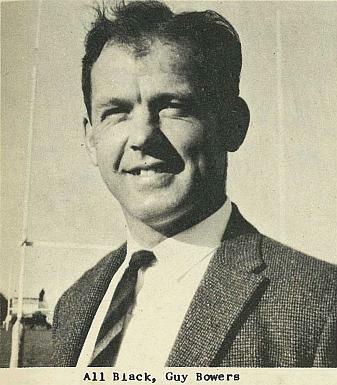 Leaving College in 1951 he went to Wellington where he gained a place in the Athletic Club's senior side and it was while he was in Wellington that he attracted the attention of the selectors, both provincial and national. He played barely a handful of games for Wellington before taking part in the trial games that preceded the selection of the team to tour Britain and France. Upon return to New Zealand he again played for Athletic in Wellington before returning to Motueka to take up tobacco farming. That year he played for New Zealand against The Rest and for the local union's representative team, but he did not gain national prominence again until 1956 when he was the South Island first five-eighths. He continued to play for Bays until 1960 and at the present time is a co-selector of the Bays' representative team. 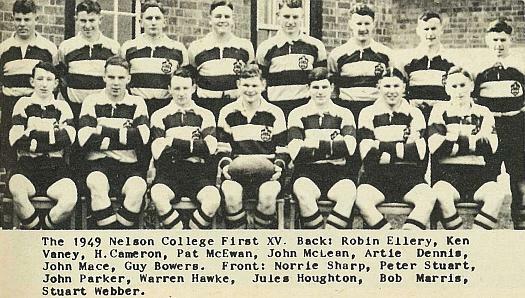 The 1949 Nelson College First XV. 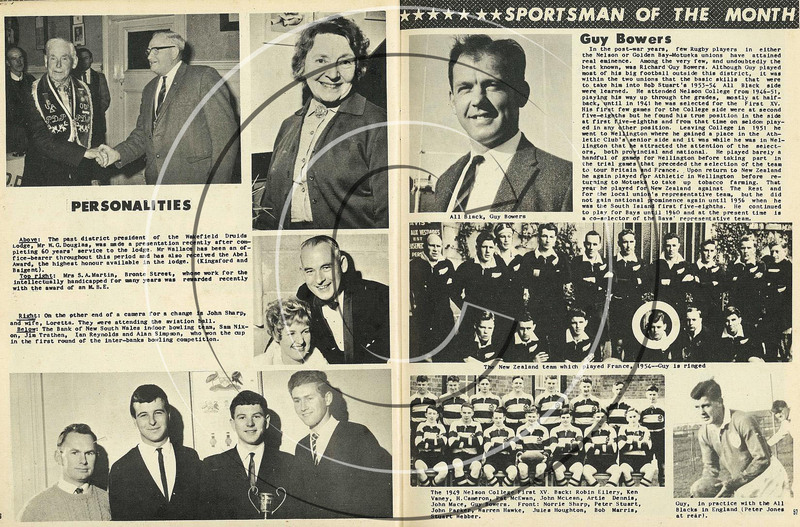 Back: Robin Ellery, Ken Vaney, H. Cameron, Pat McEwan, John McLean, Artie Dennis, John Mace, Guy Bowers. Front: Norrie Sharp, Peter Stuart, John Parker, Warren Hawke, Jules Houghton, Bob Marris, Stuart Webber. 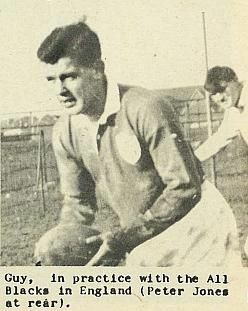 Guy, in practice with the All Blacks in England (Peter Jones at rear).